Dyslexia - body, causes, What Is Dyslexia?, What Causes Dyslexia? Dyslexia (dis-LEX-ee-a) is a learning disability that affects a person's ability to interpret written words and write and spell properly. Dyslexia is a learning disability * that makes a person unable to recognize written words properly. It comes from the combination of two Greek words: "dys," which means trouble, and "lexia," which means words. "Trouble with words" in any language translates into difficulty with reading. Most people with dyslexia also have trouble with writing and spelling. In addition, some have difficulty with numbers. Dyslexia is sometimes referred to as specific reading disability. 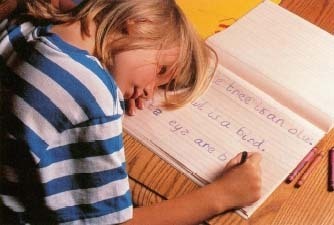 Dyslexia affects about 10 to 15 percent of school-age children. About four out of every five children with dyslexia are boys. The disorder affects all races equally and is the most common type of learning disability. No one knows for sure what causes dyslexia. However, scientists believe that it may be caused by a malfunction in part of the brain that recognizes and interprets words. Some scientists think that it is rooted in the development of the right side of the brain, which deals with processing words. When people with dyslexia look at or hear words, their eyes and ears work properly. However, a part of their brain misinterprets the words and delivers a faulty message back to them. In many cases, dyslexia may be genetic * , since people with the disorder often have a family history of learning disabilities. One thing that is not related to having dyslexia is being unintelligent or lazy. People who have difficulty reading sometimes are told that they are "stupid." This is not true. In fact, most people with dyslexia have normal or above-normal intelligence. They simply have a part of their brain that does not translate messages about written words correctly. * learning disability refers to a disorder in the basic mental processes used for language or math. The disorder occurs in people of normal or above-normal intelligence. It is not the result of an emotional disturbance or of an impairment in sight or hearing. * genetic refers to a trait that is passed from parent to child through the genes, the hereditary material that helps determine many physical and mental characteristics. How Do People Know They Have Dyslexia? Students with dyslexia often have trouble with writing and spelling as well as reading. Will and Deni McIntyre/Science Source, Photo Researchers, Inc.
to a person with dyslexia than to a person without it. Sometimes words look all jammed together, while other times there seem to be spaces between words where they do not belong. Some people with dyslexia see words backwards, as if they were viewing the words in a mirror. They may see p's where there should be b's; for example, "pall" instead of "ball." They also may see words reversed; for example, "was" instead of "saw." More often, people with dyslexia do not recognize that words are made up of small units of sound, known as phonemes * . Because reading goes hand in hand with writing, children with dyslexia often have a difficult time learning to write correctly. They may flip letters or write letters upside down. Letters that look similar may confuse such children when they try to write; for example, "doll" may become "boll." Since the letters are shaped incorrectly, the children's handwriting may be very hard to read. The ability to spell properly also is affected by dyslexia. Letters may not appear in the right order; for example, "purple" may become "pruple." Some letters may be left out entirely, making the word "puple." When children have this kind of difficulty with reading, writing, and spelling, it is easy for them to fall behind in school and feel frustrated, even though they may be very intelligent. Not surprisingly, many adults with dyslexia say that they hated reading when they were young. Fortunately, most teachers today are trained to recognize dyslexia and take action to help the child. The first step in diagnosing dyslexia is often a thorough physical exam. The physician can run various tests, including vision and hearing tests, to rule out other problems. The physician also can do a neurologic exam * to measure how well the different parts of the nervous system are working. If dyslexia is suspected, the physician may enlist the help of a specialist in learning disabilities. The specialist can administer tests to figure out how the child's brain processes information. The child may take an intelligence test * as well as academic achievement tests that assess reading and writing skills. Sometimes the child also may take tests that assess abilities in other areas, such as math, logic, and creative thinking. Once testing is completed, the specialist can determine whether the child has dyslexia by comparing the child's intelligence test against the reading and writing tests. Average or high scores on an intelligence test and low scores on reading and writing tests are typical of people with dyslexia. Wenthe Pil grims la n bed ta Plymoutthey wer ein a mostbre cariouss itua tion. T heye ar saw lateandthere wasmuc h sicknes s a mon g the sett I ers. When the Pilgrims landed at Plymouth they were in a most precarious situation. The year was late, and there was much sickness among the settlers. For most people, reading about the first American settlers is easy and interesting. For some people, though, this passage is very difficult and frustrating to read, because it looks more like the first example, not the second. People who see or hear words this way have the disorder called dyslexia. * phonemes (FO-neemz) are the smallest units of spoken language, such as the "puh" sound at the start of the word "pat." * neurologic exam refers to systematic tests of how well various parts of the nervous system are functioning. What Can Be Done about Dyslexia? The earlier a child is diagnosed with dyslexia, and the earlier the child's family and teachers are made aware of the diagnosis, the better. Children with dyslexia must learn to read in a different way from those who do not have the disorder. Many children who do not have their dyslexia diagnosed until later do poorly in school year after year, as they try to learn to read the same way everyone else does. Eventually, after their dyslexia is diagnosed, they must go back and relearn how to read. Whether it is a younger child with dyslexia who is first learning to read or an older child who is relearning, a special approach must be taken. In many cases, an individualized reading program is the first step. This means that a reading specialist creates a plan that is designed just for that child. The plan is based on many factors, such as how severe the child's dyslexia is and what the child's strengths are in other areas in school. Many times, the reading plan for a student with dyslexia will include a multisensory approach. This means that instead of just using the sense of sight, the student also will use other senses, such as touch or hearing. In some cases, a student might feel clay or wooden models of letters while saying the letters aloud. In other cases, the student might learn letter sounds while looking at pictures, or listen to letter sounds on a tape while looking at the letters. The student also can work with the reading specialist on phonemes. Eventually, the student learns to create combinations of phonemes to form words, and from there to recognize and read words. Students with dyslexia can be taught in different settings. Some are placed in special classrooms with other students who have reading disabilities, while others work one-on-one with a reading specialist at certain points during the school day. Various other types of therapy have been suggested for people with dyslexia, such as vision therapy (eye exercises) and colored glasses. However, none of these therapies have proved to be widely successful in treating the disorder. Children with dyslexia face a special challenge: not only must they learn to read, but they also must learn to read in a special way. People with dyslexia usually learn to read very slowly, and it can take lots of practice. Emotional support is very important. Many children with dyslexia complain of feeling "stupid" because they cannot read as easily as most of their classmates. With enough help and support, however, children with dyslexia can learn to read and write well. The reading and writing level that a person with dyslexia can achieve depends a lot on the severity of the disorder. For example, someone with a mild form of dyslexia may learn to read and write very well, while another person with severe dyslexia may always find reading and writing more difficult. Children with dyslexia usually grow up the same way that other children do: into healthy adults with normal lives. Many people with dyslexia go to college and excel in their classes, sometimes by using special methods such as tape recording their lectures or taking oral exams instead of written ones. Adults with dyslexia can do well in many different kinds of jobs. At present, there is no cure for dyslexia. There is no drug that people with dyslexia can take to correct the problem. Scientists constantly are studying the various parts of the brain to learn why information is interpreted incorrectly in some people. However, the brain is very complex, and there are still many mysteries about what causes dyslexia and other learning disabilities. Goldish, Meish. Everything You Need to Know About Dyslexia. New York: Rosen Publishing Group, 1998. An informational book for young people about dyslexia. Moragne, Wendy. Dyslexia. Brookfield, CT: Millbrook Press, 1997. A book about dyslexia told through the true stories of teenagers with the disorder. LD Online. A website that offers information about learning disabilities for children, parents, and teachers. Learning Disabilities Association of America, 4156 Library Road, Pittsburgh, PA 15234-1349. A national organization for people with learning disabilities and their families. National Information Center for Children and Youth with Disabilities, P.O. Box 1492, Washington, DC 20013-1492. A national information center that provides information to the public about learning disabilities and special education. The U.S. National Institutes of Health (NIH) and its member institutes have a Consumer Health Information website, with links to fact sheets about Learning Disabilities and about Why Children Succeed or Fail at Reading.